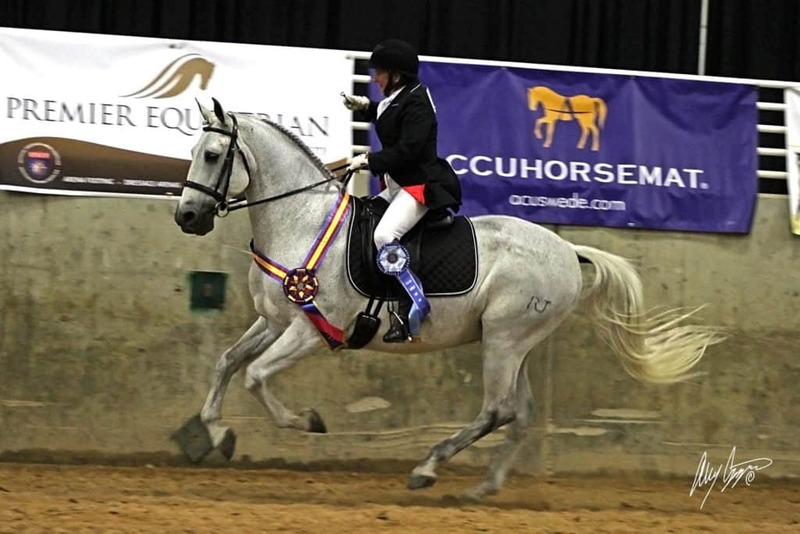 , Thursday, October 6, 2016 — South Jordan, UT — Kim Johan-Nass and Vendito RJ, a 12-year-old PRE gelding, notched win after win at the International Andalusian and Lusitano Horse Association (IALHA) National Championship Show held in South Jordan, Utah, this September. When the final count was tallied, Vendito and Johan-Ness claimed ten championships in a variety of disciplines in both amateur and open classes, including show hack, hunt seat, Western, and Doma Basico. The duo also won the Accuhorsemat Cup for staying calm under pressure and remaining relaxed during the inherent stresses of the horse show. Accuhorsemat is an innovative, non-invasive acupressure blanket that promotes healthy circulation and recovery through increased blood flow, toxin release, and muscle relaxation. 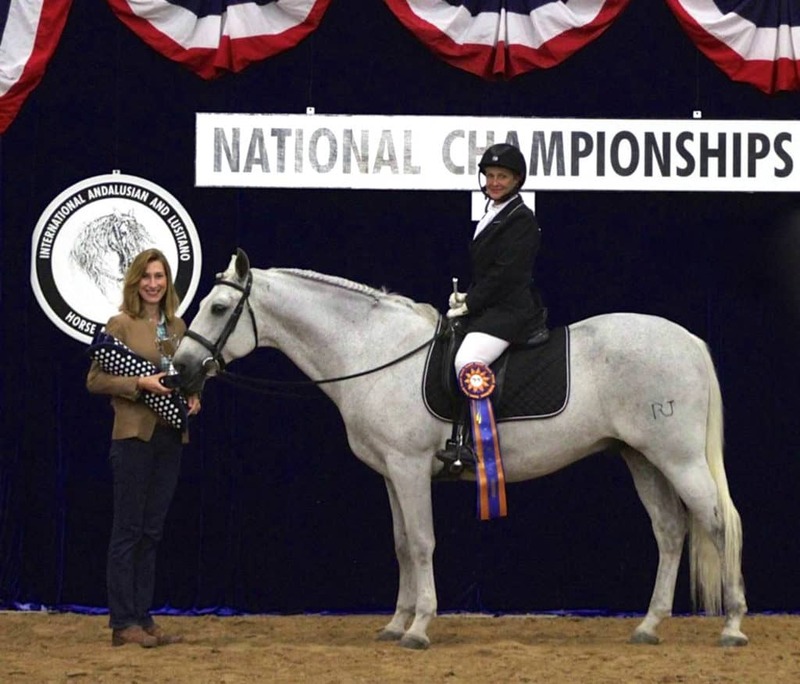 Colleen Elliott from Acuswede, the North American distributor of Accuhorsemat, attended the IALHA National Championships to present Johan-Nass and Vendito RJ with their impressive Accuhorsemat Cup trophy. Elliot also conducted a seminar for IALHA competitors who wanted to learn about the product. Johan-Nass, Vendito RJ’s owner and rider, also received a human Accuhorsemat blanket as part of her award, which she is already using and benefitting from. Johan-Nass is always looking for ways to be an even better partner with her horse. After winning the Accuhorsemat Cup, it looks like their next activity together will be using the Accuhorsemat. The human Accuhorsemat that Johan-Nass won has been helping her get knots out of her back and relieve tension, and it’s also been a hit with friends that she’s shared it with. “If it’s helping me, I think the benefits for the horse would be really, really good,” Johan-Nass said. She plans on looking into the horse Accuhorsemat next. The Accuhorsemat stimulates key acupressure points in a horse’s body to help release tension in connective tissue, allowing for more mobility and pain relief. The Accuhorsemat has the added benefits of helping loosen a horse before exercise and calming an anxious horse. Post workout, it helps sooth tired muscles. Accuhorsemat blankets were developed in Sweden to address the needs of performance horses experiencing challenges with stiffness and recovery. Top competitors like Johan-Nass know that a mentally and physically prepared horse is key to success in the show ring.